I partner with the student and use techniques such as goal setting and prioritizing to create long-lasting and effective solutions together. I believe responsibility and accountability are important for student growth and provide a structure with a balance of challenge and support. Coaching is a process which takes time and can be challenging, but those who are dedicated to it develop a commitment to excellence and success. I specialize in the Executive Functions, but have knowledge and expertise on a number of other topics--just ask us! I want you to enjoy your students, so I take on the hassle of remembering important dates, getting the student organized, and easing those homework battles you are tired of fighting. I care about your student and will use a strengths-based approach to build a personalized learning plan for each individual student. This ensures they get targeted help on what they need most. How is Success coaching different than Other Services Like tutoring or counseling? Forward-facing versus Backward-facing - Support services like counseling or advising work to determine what the past situation has been and help identify causes in the past behaviors. Success Coaching is forward-facing meaning that even though we can learn from those past behaviors, our main focus is on where you are RIGHT NOW and how we can move ahead successfully in the future. Fixed versus Growth - Support services like therapy or learning disability specialists are there to provide a diagnosis and prescribe a solution. Success Coaching believes that (based upon the work by Dr. Carol Dweck) through brain exercises and challenges, you can grow your brain, learn new skills, and master things that were previously a struggle. Expert versus Teammate - Support services like tutoring, advising, and mentoring assume that there is one expert in the relationship and information should flow from the expert to the student. In Success Coaching, we are both experts (you are the expert on you! ), so we use both of our expertise to work as a team and develop solutions that we are both engaged in and committed to. This creates independence, self-advocacy, and accountability in our partnership. One Subject versus Holistic Learning - Unlike a tutor, who focuses on teaching a single content area, Success Coaching focuses on learning habits across all content areas, focusing on meta-cognition, habits, study routines and learning strategies to help the student troubleshoot their own learning. Often the strategies put in place are useful across ALL subjects, and not just the specific subject that the student thinks they need support in. 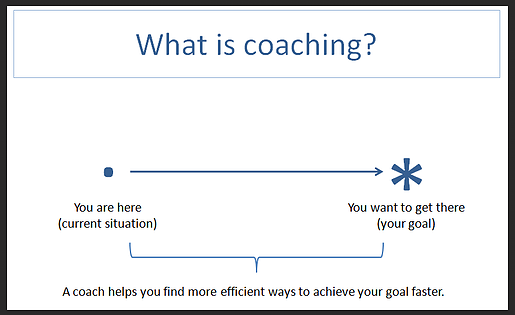 How is Success Coaching Different than Academic, Life, Executive, and Sports Coaching? An Academic Coach helps with school and study skills. A Life Coach helps with career transitions and life purpose. An Executive Coach helps with business and personnel matters. A Sports Coach helps with physical skills and technique. A Success Coach helps with a variety of skills; provides a strong, supportive presence; gets to know your student deeply and personally; and specifically focuses on students and families. 1. Decide if Success Coaching is right for you and your student. 2. If so, fill out our interest form. 3. Seattle Success Coaching will follow up to answer any questions and schedule a Set up for Success session. 4. At the Set up for Success session, we will meet and learn all about you and your student; talk about Success Coaching; discuss packages, goals, and results; and get you signed up as an official member of Seattle Success Coaching. 5. At each appointment, the student sets the agenda and works with the coach toward the goals agreed upon in the Set up for Success session. 6. The coach continues the work in between meetings by providing nudges to the students, creating activities and resources for the next meeting, and supporting and encouraging. 4. At the Set up for Success session, I will meet and learn all about you and your student; talk about Success Coaching; discuss packages, goals, and results; and get you signed up as an official member of Seattle Success Coaching. 5. At each appointment, the student sets the agenda and works with me toward the goals agreed upon in the Set up for Success session. 6. I continue the work in between meetings by providing nudges to the students, creating activities and resources for the next meeting, and supporting and encouraging.